This week on Andrea Beck we packed our bags to travel eastwards! Bamboo is a strong and long-lived plant that plays a very important part in asian culture, history and mythology. For example it’s a symbol of longevity in China, while it’s a symbol of friendship in India. According to some myths, humanity emerged from a bamboo plant. Discover the natural strenght of this plant in the brush set by Zoeva: 12 brushes made of bamboo handles and synthethic bristles, they comes in a practical cotton bag. Let’s stop in China and do some shopping to buy a beautiful cheongsam, the traditional chinese female dress born during the Qing Dynasty. The current model consists in a tight-fitting dress typically high-necked created in the 1920s in the modern and dynamic Shangai. 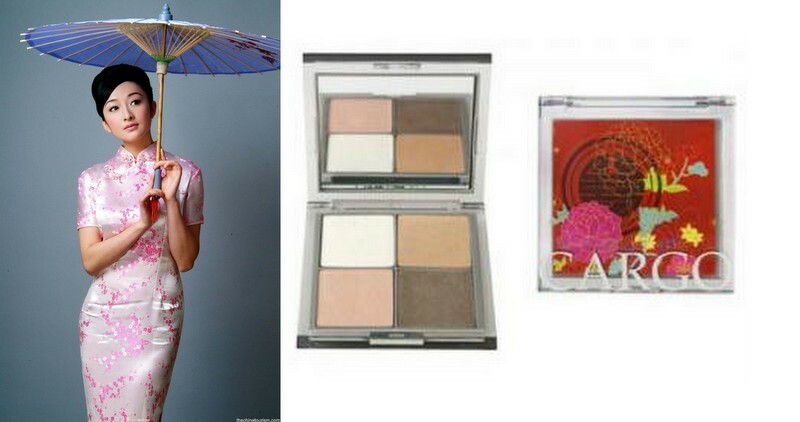 If you like the cheongsam in soft colours, then let Shangai’s palette by Cargo inspires you to create the perfect makeup. Cherry blossom is a japanese symbol representing the ephemeral nature of life but it’s meant to be a good omen symbol, an invitation to live our life to the fullest. Close your eyes while you massage the body milk by Bottega Verde and imagine to be surrounded by beautiful cherry trees in bloom. It will be like being part of the magical atmosphere of the Hanami, the typical japanese event that every spring celebrate the cherry blossom. If you need to take rest then stay at one of the thousand onsen (hot springs) in Japan, and prefer a onsen in the countryside for a totally relaxing experience. Having a bath in the natural hot water rich in minerals will regenerate your body and mind. When you return home, find the same atmosphere in your bathroom with the bath salts by The Body Shop: they have green tea extracts and yuzu to give you a lenitive and relaxing bath. This perfume by Guerlain is a classic created in 1921 and inspired by the suggestions of the marvelous garden of Shalimar. The fragrance represent the great love between the emperor Shah Jahan and his third wife Mumtaz Mahal. When she died the emperor built in her memory the beautiful mausoleum called Taj Mahal, located in Agra, India. Today the Taj Mahal is considered one of the seven wonders of the modern world.